Glentoran's Curtis Allen makes it 1-1 late on against Queen's. Curtis Allen’s late double strike prevented Glentoran from ending with a huge amount of egg on their face in this County Antrim Shield first round tie at the Oval. Little Queen’s University arrived with the odds stacked heavily against them. But they battled manfully and came within 17 minutes of pulling off the biggest shock of the night. They led through a Christopher Middleton strike and appeared content to soak up everything the Glens could through at them. But Allen’s late party piece at least sent the home fans home happy. Strangely, the Under-20’s defeated the Students in the Steel & Sons Cup at the weekend, so the striker certainly spared the East Belfast boys’ blushes. Although Glentoran totally dominated the opening 45 minutes, they trooped off at half-time trailing to a Christopher Middleton goal, nicked in first half injury time. 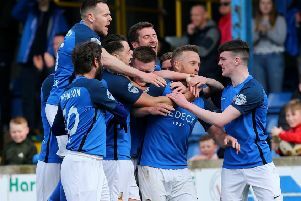 They did threaten in their first foray into their opponents’ half with defender Ronan Young trying his luck with a 30-yard free kick that Elliott Morris saved at the base of the post. But with referee Keith Kennedy primed to blow up for the interval, Joshua Corry’s long throw was allowed to trickle through the Middleton, whose low drive flashed past a startled Morris. Before that, it was all one-way traffic in the direction of the Students’ goal. The energetic John McGuigan burst through the middle on 11 minutes only to see his shot deflected on to the post by goalkeeper Declan Brown. But after riding out the early storm, the Bluefin Sport Premier Intermediate League side grew into the game and set up a possible shock with the Middleton strike. The Glens attempted to salvage the situation after the half-time cuppa. Brown was forced into a smart save to keep out a Marcus Kane cross that deflected off defender Thomas Grimley. Then, when Connor Pepper was sent flying by a clumsy challenge from Andrew Foster, McGuigan’s free kick led to a bout of ping-pong inside the six-yard box. Brown eventually got a glove to the ball to fist clear. The home fans did have something to cheer 17 minutes from time. McGuigan created the opening for Allen, who simply had to tap home from two yards. McGuigan then brought the best of Brown with a header that looked destined for the top corner. But Allen struck again with just six minutes left. Kane’s low shot somehow found the striker inside the box and, with his back to goal, he cheekily back-heeled the winner. GLENTORAN: Morris, Kane, Birney, Herron (Davidson 72), Allen, McGuigan, Pepper, Gordon (Kerr 64), Redman, Byrne (McMahon 53), Ferrin. Unused subs: Nelson, Garrett, McCarthy, O’Neill. QUEEN’S UNIVERSITY: Brown, Corry, Young, Grimley, Robinson, Walsh, Middleton, Mulgrew (McIlroy 86), McCready (O’Hare 58), Foster (Bonnes 73), Hughes. Unused subs: McManus, Henderson, Henderson.